I'm thrilled to share the first of three house tours for the month of February! 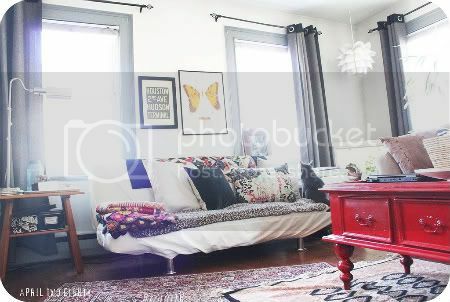 This is the lovely home of Brooke Biette, an anesthesia technician by day and a talented quilter, photographer, designer, and stylist by night. I first saw images of her home in her flickr feed as I was browsing through someone's favorites and contacted her about sharing it on my blog. I've asked her to share a little bit about her interior style below. * How would you describe your interior style? 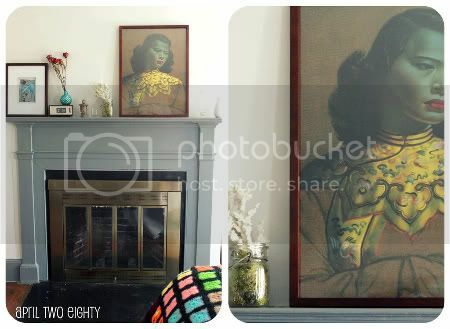 My interior style is a bit eclectic - I love both vintage and modern styles. Also, living with my boyfriend and THREE cats can be challenging at times, as far as decorating and keeping things clean. I'm lucky that my boyfriend pretty much lets me decorate however I want to, though! In the past year or so I have started a big de-clutter project around the home, so that has influenced our interior style greatly! Even as a kiddo I loved rearranging my Barbie house's furniture, and as a teenage I constantly rearranged my bedroom. I didn't really get into it more seriously until college though, I always had the best decorated dorm rooms (or so said my friends ;)). My first apartment after college was a tiny one room efficiency space in the basement of an old building, but I definitely made it my own. 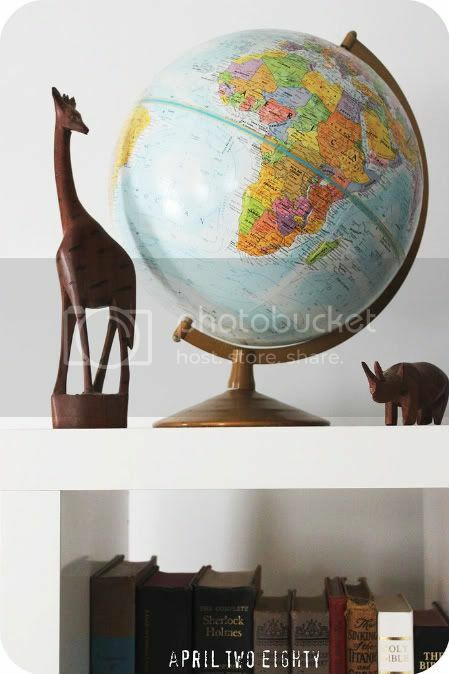 I am lucky that my boyfriend and I have been able to rent a few really great apartments over the years, which have given us great spaces to decorate! (The only thing about our current place that I dislike but cannot change is the gray trim around every doorway and window. I've tried to incorporate it into the decor best I can, though...) I would say I got the most serious into decorating sometime in 2004, and it hasn't stopped since. * What has most influenced your style? People in your life, places you've been, online design blogs, money, etc. I would say it has been a mix of all of those things. Constantly being given hand-me-downs in my poor-er days, some of those items have become well-loved treasures! I definitely decorate based on budget, though; its very rare for us to buy any elaborate and expensive pieces. I scour a huge list of design blogs (you can find my list of favorites on my blog!) weekly to get inspired. * Which is your favorite room? Why? My favorite room right now is the bedroom. I think its a perfect mix between new & old. * Where is it all from? 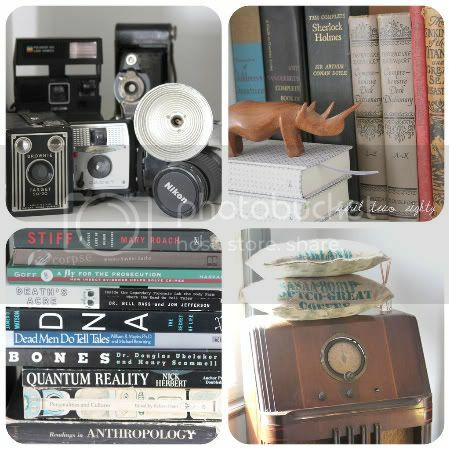 Some of my favorite vintage pieces are in there, some of which came from antique shops instate, some from my parents' basement (the stand up radio!) and Etsy (cameras, etc)... alongside my more modern Ikea 'Expedit' shelf. * What do you have your eye on that you hope to own someday? I would love to get one of those white Eames rocker chairs. I'm dying to get on of those. For now it won't fit in our living room, but further on down the road if we own a house or condo, I'll definitely be incorporating one into our decor! * Do you feel like your space is working for you or have you had to adjust your expectations of 'perfect'? Our space works really well for us in this apartment. I'm lucky that the 'extra' room has been converted into my sewing room - I've definitely worked in much smaller spaces, but it is so nice to have the room to spread out and not feel guilty or like I'm taking away valuable space from another room. The rooms in this apartment are really the perfect size for us - not too small but not too spacious. Now that I've been de-cluttering, it's even better! * Quick! People are coming over and the house is a mess! What do you tackle first to feel like things are presentable? I think we've finally gotten to a point where almost everything we own has a home or a bin or a spot, so we've been working hard to keep it tidy as much as possible (without having to try too hard). Its nice to not have to scramble so much at the last minute if someone is coming over. 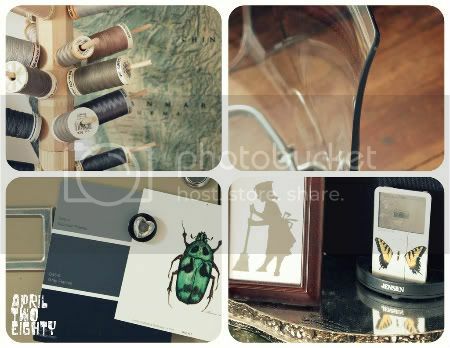 I love the mix of vintage and modern with a little DIY and handmade in the mix. 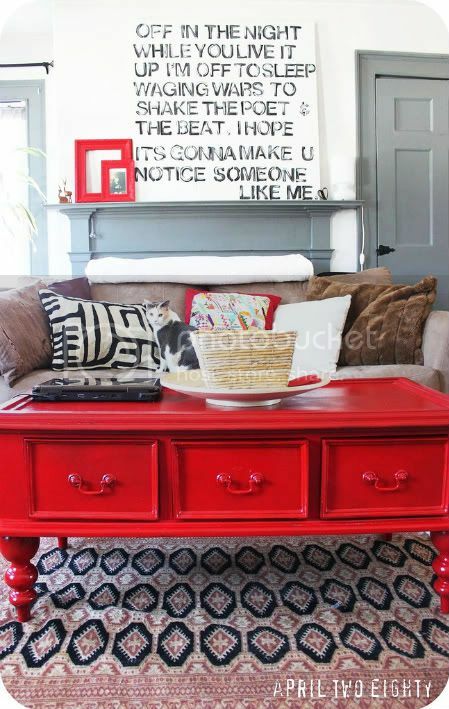 Her red coffee table really makes the living room and I love all of the art on the walls. 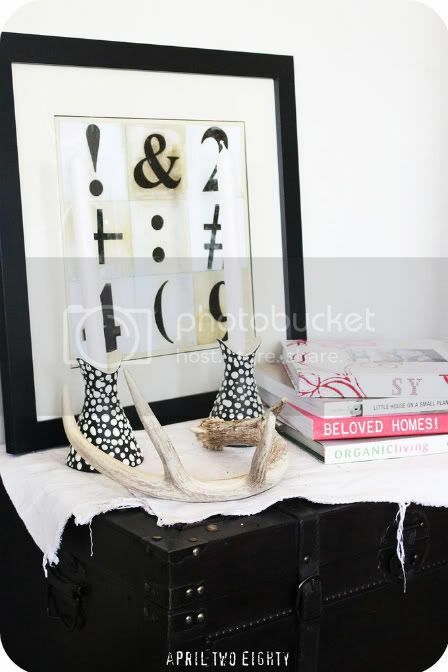 Brooke, thanks for the lovely house tour and for sharing how you've curated such a beautiful space! 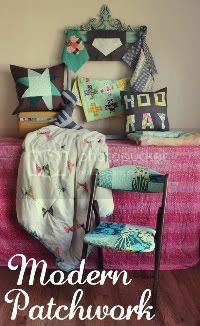 Brooke is de-stashing this year which means some pretty fabric available in her Etsy shop here. 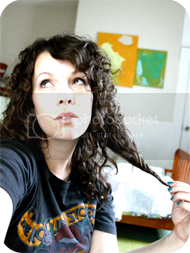 You can read more about Brooke and see more images of her beautiful work and living space here. Look for another beautiful home tour next Thursday! 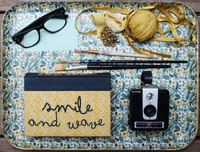 Brooke is one of my favorite people to watch on her blog and on flickr :) I am currently coveting her glasses! WOW!!! i LOVE her style! 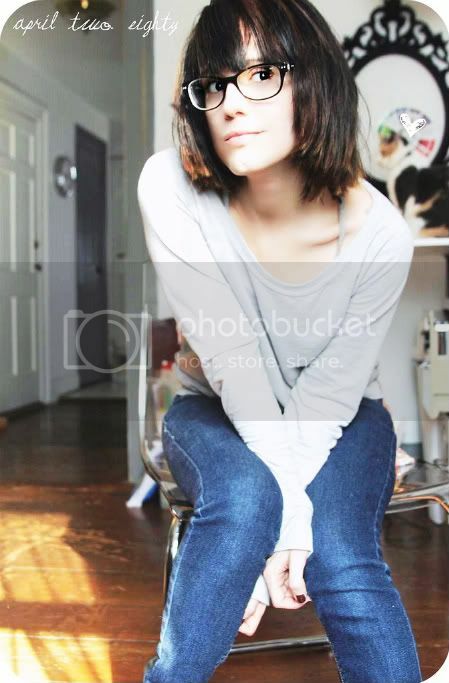 <3 def bookmarking her blog. what a stunning space - loads of inspiration here and I also really love that red coffee table and the mixture of fabric patterns and textures throughout has really caught my eye. Love her style! Stealing ideas now. What a fun feature to do. I've been giving little tours of my home sweet home on my blog as I've been slowly redecorating it. It's been so much fun. Have a great day Rachel! What I REALLY need to know is what glasses she's wearing! I love this space & the style. 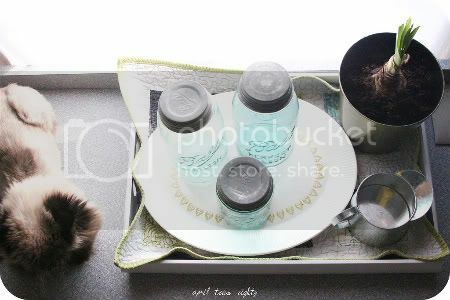 I love the look of little collections here & there. Great style. I love how it is so relaxed, yet organized. And the bright splashes of color are wonderful. I love Brooke and her style. 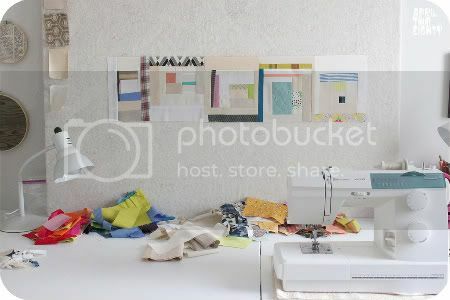 She's a great inspiration to use quilter/sewers out in flickr world! And she is soooo nice too! This post felt really fresh. I enjoyed it a lot!! Great new feature, Rachel! Loved it....at LOT! I can see why Brooke's home caught your eye; it's very inspiring, in both a comfortable and exciting way. I'll be looking forward to the next home tour! Ok, so her place is lovely, but I am more interested, did you make that cute little doll house? Oh goodness. 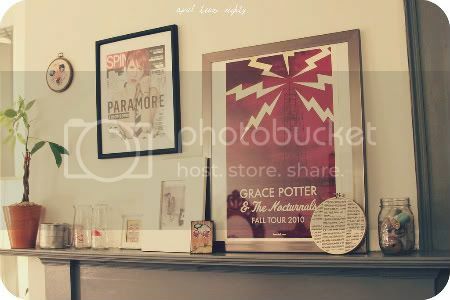 I want her house. Bad. I LOVE mixing vintage and modern. I'm the "I'll know it when I see it" kind of shopper. thanks for sharing this house tour... 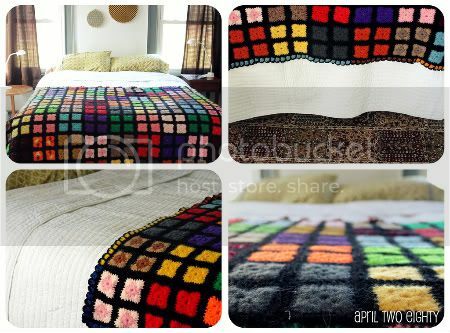 I'm going to check out her blog, I'm interested to see more of her decorating ideas and quilts. I'm so happy to see you feature Brooke! She is so talented, and such a sweetie. Her style is wonderful. This is a really, really lovely and inspirational home. Thanks for sharing! Where did you found this fabulous thread tree?